My summer kitchen is bursting at the seams. Of course I found more lurking zucchini after dispatching yesterday’s, we had barely gotten through last week’s vegetables when this week’s CSA box arrived, the tomatoes are finally going in the garden, and the pears and plums are ready to pick. On top of all that, we have a lovely friend who always calls us when her figs are ripe, and J came home one recent evening with a brimming box of perfect green figs. So today was a jam day. For the past few years we have usually done our canning late at night, after the girls fall asleep, but recently it seems to fit more easily into the fabric of a weekend daytime. The girls help mash the fruit and measure the sugar. J washes jars, I stir the pot. We take turns chasing the baby out of the kitchen. Everyone contributes to the all-important task of taste-testing. We are fortunate to live in a time and place of plenty, to know that preserving good food for the winter is a bit of a luxury rather than a necessity. Because with three little ones underfoot, it took much of the afternoon to turn that box of figs into tasty little jars of jam. But we can only eat so many figs in a week, and it’s nice to know that we’ll have the rest of them to spread onto thick slices of toast all winter. 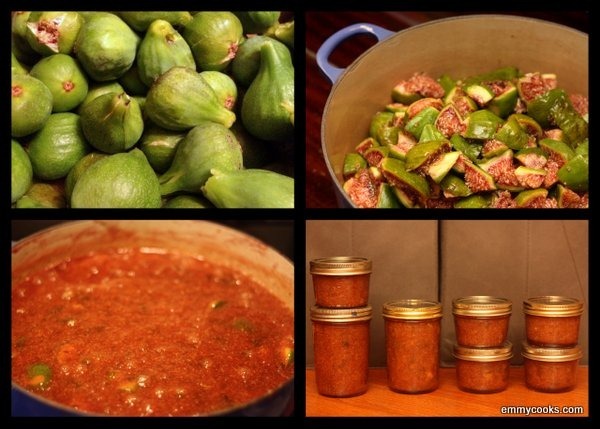 Fig Jam: Wash figs and cut into chunks. Mash or puree the fruit (I used my immersion blender, but left the figs a little chunky). Transfer to a heavy-bottomed pot. For each 4 c. mashed figs, add 1/4 c. lemon juice and 4 tsp. Pomona’s calcium water (the mix comes in the box with Pomona’s pectin) to the fruit. Bring to a boil over medium-high heat. Watch out, the thick fruit may splash when it bubbles, and it’s hot! In a separate bowl, mix 3 tsp. Pomona’s pectin into 1 c. sugar. When the fruit reaches a boil, stir in the sugar and pectin mixture and stir well for another minute or two to melt the sugar and pectin. Now comes the fun part: start tasting! Add more sugar if desired (some recipes call for equal parts fruit and sugar by weight, so feel free to go crazy, but one cup of sugar will probably be plenty if your figs are sweet to begin with). Return jam to a boil, then remove from heat. Fill sterilized jars and freeze or can your jam for storage. Be sure to keep some in the fridge for tomorrow’s breakfast; you’ve earned it! This entry was posted in DIY, Food, Fruit, Recipes, Vegan or Would-Be-Just-As-Good-Vegan and tagged fig jam, jam recipe, summer fruit recipes, urban homesteading on August 25, 2012 by emmycooks. What perfect timing! The fig tree outside my door is about to unleash a boatload of fruit, and I want to find something to do with them so they don’t fall on the ground and get sticky underfoot. Thanks for the idea! Lucky you! I’m sure you have plenty of ideas about how to enjoy your bumper crop, but here’s a new one I saw today (I wish I could remember where): cauliflower roasted with garlic and sliced figs. Sounds intriguing to me! My mom absolutely loves figs. I’ve called her and shared your recipe with her. She’s so thrilled! Thanks! Note to self: plant fig tree. What a wonderful recipe and beautiful photos! We love fig jam with sheep’s cheese around here….would love to put some up this way! I love that combination too–sweet and salty, yum! My 2nd crop is figs is just about ready. I’m already dreaming of ways to eat my fig jam. As soon as I get my hands on some figs, I’m trying it with the crystallized ginger. I thing everything is better with ginger! Great looking jam! Mmm, crystallized ginger. I do like the spice of ginger with the sweetness of figs! No fig sharing friends yet in Denver, so I’m stuck buying fig spread from the supermarket. Your canning looks great! Fig jam is delicious no matter the source. And buying it from the store is a heck of a lot less work. :) In addition to all the jam we make I can never resist buying the occasional jar–there are just too many great varieties! You seriously should. They are probably dying to get rid of the figs before they fall, make a disaster of the ground, and attract a clan of squirrels. Especially if you offer to pick and share part of your harvest! A friend with figs? My, you are a lucky girl! I just made fig jam recently, too! I’m going to post about it soon. I wish I’d known about your fig-ginger variation, though! Great minds think alike! It’s always a big dilemma for me, whether to add ginger or not, so really it’s probably better that you didn’t have the question in mind. I so wish I had a friend who would bring me some fresh figs. How lovely! Wow! Fig jam sound so rich and delicious! Rich is a good description! We’ve really been enjoying it. I adore figs and haven’t made jam with them before – can’t wait! Thanks for sharing!